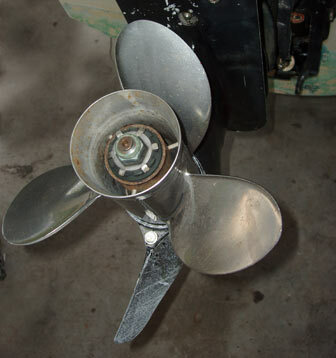 3-blade stainless steel prop on a Mercury 70hp outboard lasts for years despite numerous groundings. Buying a different propeller can dramatically change the performance of your boat. You can select a propeller for the pickup or hole shot it offers, for the top speed, or for the maximum efficiency at cruise power. What you cannot generally find is a propeller that will offer all 3 benefits, or some others such as resistance to cavitation or ventilation or smoother operation with less vibration. By maximizing any one characteristic, you will usually detract from one or more of the rest. If you only use your boat for one purpose, or if one prop characteristic has overriding importance to you, you may want to focus only on that particular thing. Most of us, however, want a balance of various characteristics. On my 15' Boston Whaler, I want good pickup for water skiing and escaping from shallow water, but I also want good efficiency at cruising speed, and of course I want maximum performance at top speed. I can't have all three of those without buying three props, so I look for the best overall balance. Fortunately, the previous owner had bought a nice stainless steel prop of moderate pitch, which works well on the boat. The primary factors that affect how a propeller will perform with a given boat and engine are propeller diameter, propeller blade pitch angle, and number of propeller blades. Other factors include the materials used to make the prop, propeller blade rake angle, cupping the edges of propeller blades, and propeller ventilation using excess exhaust gasses or a surface piercing design. Propellers are sold with a given diameter and pitch, usually expressed as Diameter X Pitch, or D X P. The diameter is usually dictated by engine and gearcase design, with few if any options offered, so changing to a propeller with a different blade pitch is the most common propeller change. A prop with a higher pitch pushes more water in each revolution than one with a lower pitch. Given that, why wouldn't we want a very high pitch prop? There are a few reasons. First, the engine has to work harder to get that high pitch prop spinning, meaning the boat will suffer from slower pickup. Second, a propeller with a pitch that is too high for the boat/engine combination will overload the engine, preventing it from rotating within the recommended maximum RPM range at full throttle. Third, high pitch propellers tend to pull the boat sideways during slow speed maneuvers near docks more than their low pitch counterparts. A lower blade pitch propeller will push less water in one revolution than one with high pitch, so it is easier for the engine to get it going. That means more responsiveness (and less sideways motion) at slow speeds, and the ability to pick up onto a plane more quickly. If you water ski or fish the flats, the ability to plane quickly with a heavy load is very important, so the temptation may be to get the lowest pitch prop available for your engine. So what happens if you go too far? At cruise throttle settings, the engine will be turning more RPMs, and more rotation means more drag and less efficiency. At full throttle, the engine may exceed the maximum RPM range, which can cause damage. In addition to potential damage to your engine, exceeding the max RPM range also robs your engine of power. Every boat and engine combination has different propeller needs, but in general I have observed that a higher pitch prop will give better fuel economy at cruising speeds and a faster top speed, so long as the engine can achieve the rated RPM range for wide open throttle. A lower pitch prop will allow quicker planing, at the cost of some cruise efficiency and top end performance. To find the best prop for your needs, you will need to test a few different ones. Turning Point Propellers has a handy Prop Wizard, and the Recreational Boat Building Industry's propeller calculator can give you a general idea of which diameter and pitch propeller might be right for your boat. Or just ask some owners or dealers who are familiar with the boat. If your boat is not fitted with a tachometer for measuring engine RPMs and you do not want to install one, consider purchasing a portable Extech Combination Contact/Photo Tachometer. 5-blade stainless prop with cupped edges on Mercury 225hp Optimax. 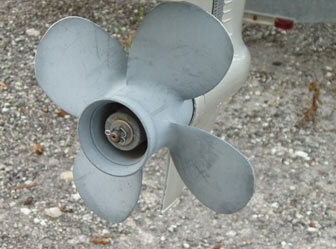 It is important to conduct a realistic test to properly evaluate potential propellers for your boat. Do not test propellers with the boat empty. Load the boat as you would normally load it when fishing, skiing, or cruising. Don't test it only in flat calm water. 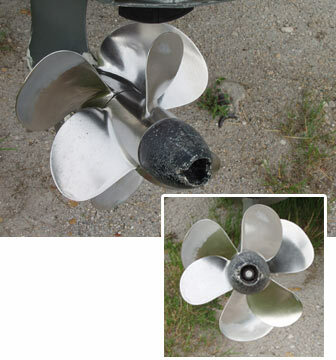 A propeller might perform fine in flat water, but be prone to ventilation when planing in chop. Going to a blade with a higher rake angle or cupped edges can reduce cavitation/ventilation when riding through large waves. More blades can also help reduce ventilation and increase blade bite in rough weather. My neighbor has a classic 20' Sea Craft Master Angler which he recently repowered with a new 225 hp Optimax Mercury outboard engine. Because he wants to use it to fish in shallow water and to pull skiers, it is important that the boat get up on plane quickly even when heavily loaded. After trying a few propellers, he settled on a 5 bladed HighFive prop. Although more blades mean more drag, he found that the pickup was dramatically improved with that prop, and cruise and top end performance were only slightly affected. The extra blades allow for the use of a smaller diameter and a high pitch and rake. The double cupped trailing edges of the blades increase blade bite and reduce ventilation when the engine is trimmed very high to cross shallow water. He has also installed a Doel fin planing fin on the cavitation plate. Planing fins help to get the boat on plane faster and reduce ventilation in turns. The slightly increased drag can reduce top speed performance, but not by very much in my experience. Planing fins also help a boat get on plane faster and allow it to stay on plane at a lower speed. Planing fins are horizontal fins that mount on the lower unit a few inches above the propeller. Water flows over the fins, creating lift, similar to how air flowing over an airplane's wing creates lift. The additional lift from the planing fin improves propeller efficiency and rough-water handling, reduces cavitation, and reduces fuel usage. It also gives you a quicker hole shot, or the ability to get up on plane faster in a shorter distance — which is important when you're in the shallows and have only a small length of deeper water to get on plane. This Honda high-thrust 4-blade prop is made specifically for applications where high thrust is needed under high load and at low speed. To combat torque effects on boat steering and to handle larger engines, some manufacturers such as Mercury and Volvo now sell sterndrive engines with duoprops. Duoprops are two counterrotating propellers mounted together in line on a single shaft. The "upstream" prop has fairly flat pitch and larger, rounded blades, while the "downstream" prop has more conventional blade shape. For twin engine applications, there are conventional counterrotating propellers, designed to turn counterclockwise. Also called left hand rotation propellers, these require a non-standard gearcase so that the shaft rotates in the opposite direction. Counter rotating propellers on twin engine boats greatly reduce unwanted steerage effects such as torque rotation of the hull on plane and side slipping at slow speeds when docking. Sailboats and other non-planing boats such as tugboats and trawlers have different propeller needs from planing type outboard and sterndrive boats. The engine on a sailboat has to push a great deal more weight and push it much slower than in normal powerboat applications. To get the full rated power out of the engine, it is necessary to go to a very low pitch propeller, sometimes in a bit larger diameter and/or with more blades. An example is this Honda outboard (pictured at left) with a high thrust 4 bladed prop specifically made for applications where high thrust is needed under a high load and at low speed. With a normal propeller, the engine would not be able to achieve its maximum rated RPM range, so it would be unable to produce full power and would likely be subject to side effects of overloading such as fouled spark plugs. Inboard diesel sailboat engines are usually run with two or three bladed bronze props of fairly low pitch. The two bladed props are preferred due to lower drag, but some cruisers report that the extra thrust from a three bladed prop will push their boats faster, especially when pounding into waves. Some special propeller applications require unconventional high performance propellers. Bass boats, flats boats, and race boats often run with high trim angles on high power engines at high speeds. Because of the excess power, and because they are operated very fast near the surface, these types of boats can be prone to propeller ventilation or cavitation, resulting in engine overrevving and loss of power. The problems can be addressed by using very high pitch angle propellers that are made to run right at the surface and are made to ventilate in a controlled way. In some cases, the engine exhaust flows over the propeller hub instead of through it, inducing ventilation at lower speeds so that the engine can get up to speed more quickly. Other propellers with through-hub exhaust have holes drilled into the propeller hub, inducing ventilation to create the same effect. Whether they use over the hub or through hub exhaust, these high performance props need some ventilation to help them get a start. Surface piercing props have extremely high pitch blades with pointed blade tips, and are another type of prop which is designed to ventilate while running. These props are used on racing hydrofoils and on high performance offshore race boats equipped with Arneson or other surface piercing outdrives. 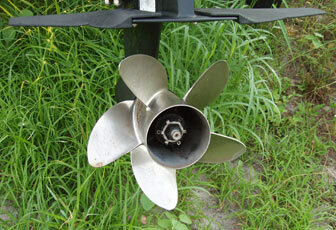 Most outboard and stern drive engines are sold with aluminum propellers of moderate pitch, suitable for most uses. Smaller engines sometimes have composite plastic props. Aluminum and plastic propellers are lighter in weight than their stainless steel counterparts, but they are also more prone to bending under load, so the blades must be made thicker. Aluminum and plastic props are much less durable than stainless steel ones, and it is easy to damage them by running aground or hitting floating debris. Although they are less expensive, aluminum propellers must be replaced more frequently, so over time the investment in a durable stainless steel prop makes more sense. Turning Point Propellers has a handy Prop Wizard to help you select the right propeller for your boat. There may not be a prop which gives you 4,500 rpm. My guess is that if you go one step lower in pitch, you will get a bit more than 4,500 at full throttle. That”s just a guess, and the only real way to find out is to keep trying different props until you find the right one. Keep in mind that factors other than the prop will affect max rpm. The bottom of the boat and outdrive should be clean, the engine should be tuned, and the load carried should be average. Also, unless you like racing, the prop which produces the max rated rpm from the engine is not necessarily the best prop. I have found that “overpropping” a boat a bit can increase fuel efficiency, so you may already have the best prop from that standpoint. Before checking a lower pitch prop, measure the fuel burn per hour with this one. If you do not have a fuel flow meter, you can do that by just filling up the boat and running at cruise speed for a set length of time, then filling it again. By the time you’re done, you will have slightly used props on your hands. Keep one as a spare and sell the rest on eBay!